← The Big BOD Launch! It might have been Jeremy Newman’s first race of the season, and he might still be in recovery from a major knee op, but that didn’t seem to hamper him in any way in his assault on the BOD Mini Series on Sunday 20 July. 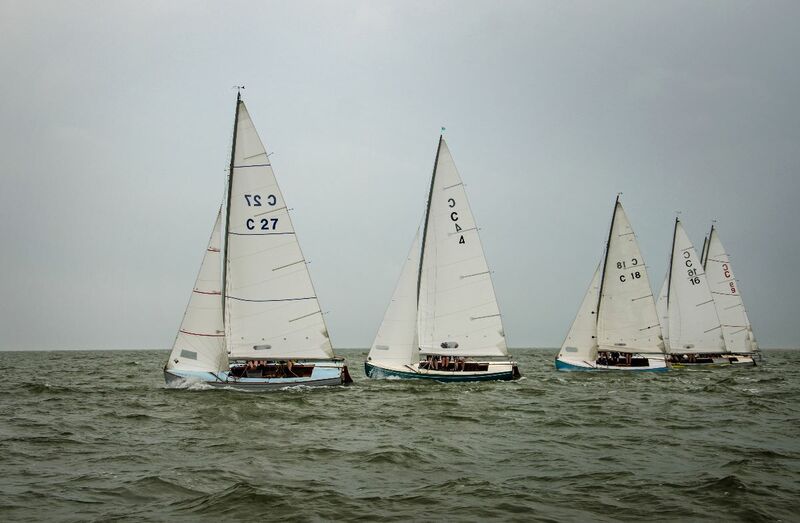 Under the watchful eye of Race Officer Barry Newman, 13 BOD teams came to the line for the three race mini series. Race one saw the boats completing the first of three windward leeward races in a force three, but the wind dropped off to a force two for the second and third races. This was a fantastic opportunity to tune up for Pyefleet Week and it’s clear that the competition is going to be cutthroat. Although Jeremy and Avocet claimed victory in all races they had plenty of challengers and Chris Matthews in Rebel, Danny Fox in Egret, Dan Willet in Bidi and Malcolm Goodwin in the newly launched Cormorant were all more than on the pace. Alan Hicks sailing Storm Petrel also had good speed and sailed well despite the fact that he was sailing one short and with a novice BOD crew. After three races and with one discard allowed, Jeremy and Avocet claimed the top step of the podium with Rebel second, Egret third, Bidi fourth, Cormorant fifth, Storm Petrel sixth, Dulcet seventh, White Spirit eighth, Gelsama ninth, Blue Peter tenth, Jumbo Too eleventh, Ruff twelfth and Panic thirteenth.